This week, the valley of Mostar has once again been covered with smog. The chilly nights mean people are burning wood and perhaps coal. the thick white smoke can be seen in the distance, but it also means you can be breathing it in. Even running in the hills does not mean clean air. Like many people in BiH at this time of year, i have been coughing and waking with headaches. Of course, it is not as bad as Tuzla or Zenica or even Sarajevo. I see photos and read articles in the paper that describe the poor air quality as far beyond acceptable standards. In Zenica, it is the coal powered factories, who won’t use filters. 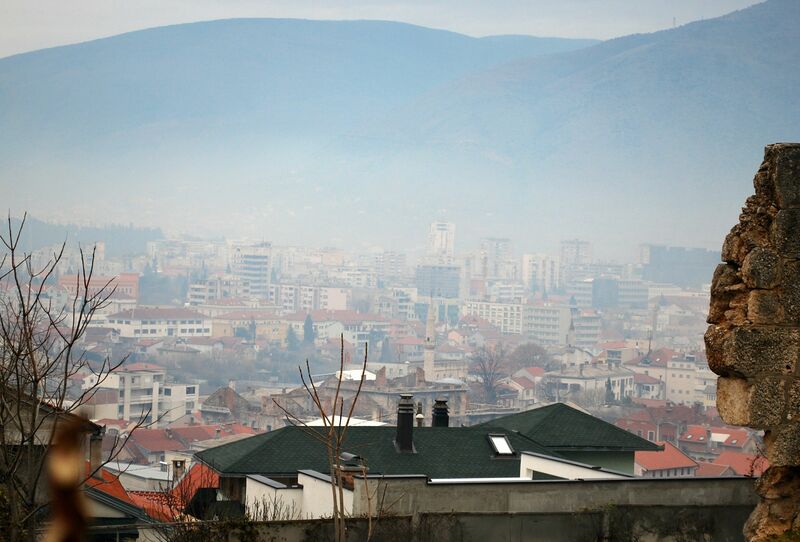 In Sarajevo, heating systems and cars are the source of pollution. In these cities, geography also plays a part. Set in valleys, the pollution just lingers until a wind blows it away. So, I put off my trip to Tuzla when I read how bad the pollution was there. People were told to stay inside or breathe through a scarf or mask. I wanted to return to see what I missed four years ago. It isn’t worth it. The city is covered with smog, and I am still suffering from severe headaches here. I did some research and these headaches are likely caused by carbon monoxide poisoning from the wood smoke. Wood smoke is considered one of the worst ways you can pollute the air. But so many people here have wood stoves, and no access or money to convert heating systems to electric. I keep thinking that solar energy would be answer down here, where the sun is so present and strong. In addition to the smog, there is the ever present cigarette smoke. On the weekends, the big mall is full of people sitting in cafes, smoking. Although there are signs indicating no smoking, the cafes have tables in the corridors, and the smoke fills the building. What astonishes me are the young couples smoking next to their nicely bundled up babies. And yesterday, as I walked to the Foreigner’s office to pick up ( at last) my residence permit, I passed two Roma women with their children. One child, perhaps six years old, was alone begging. He followed people walking, begging. I looked at him, in his dirty clothes, with uncombed hair and dirty hands outstretched. The mother was at the other end, trying to hold her squirming baby, who was, like all babies, curious about the world around it. Some people gave a few coins, others ignored him. One woman frowned and said something to her own child. Another child was alone on the street, with a cardboard box for coins. I have seen these women digging out of the dumpsters, and children using the alley as a public toilet. The status of these children is a depressing feature of life here. From what I read, their status is unclear, and many have no papers, which means no access to help. No schools in Roma language. No health care. How do they survive? Why is nothing done? No one really discusses this issue. We, too, have poverty in America, and I have read several articles in the paper today about women desperately seeking stability for their children. We have our usual arguments about health insurance, and health care. But still, there is a sense of a safety net. I never know if giving a few coins to these children helps or hurts. They need education, health care, and stability. Begging all day …as a teacher, I find this so terrible to see. As a foreigner, I feel my hands are tied. Is it their culture? Do I have a right to judge? This entry was posted in Uncategorized and tagged cigarette smoke, health, mostar, Roma, smog, Tulza, Zenica. Bookmark the permalink.